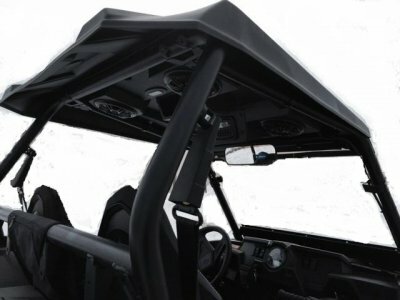 ”Cooter Brown” top and Stereo Fits: 2014-2017 XP1K and 2015-17 RZR 900 and 2016-17 RZR-S 1000 Includes: Top and Pre-Wired Stereo. Thermoformed from Thick Polyethylene. Black Texture. Very Durable, virtually unbreakable from normal use Attaches with Rubber coated straps and stock bolts. Protects from rain, sun and snow. Ships UPS to your door (over sized). BLUETOOTH Includes: Top, Waterproof Stereo, Plastic Stereo Housing, Antenna, and 6’ of power cable. (4) 60 Watt Marine Speakers. Hard wired 12V Map Light. Made in the USA. Protect yourself and a passenger from rain, snow, and the sun. Thermoformed from thick Polyethylene Plastic (the same material ATV fenders are made out of). Extends all the way to the sides protecting your shoulders (unlike other tops on the market). If you have every owned a “Cooter Brown” top for your older RZR you understand the durability of this top. The Multimedia Receiver features Bluetooth audio technology that lets you stream music wirelessly from your Bluetooth device. This surface-mount receiver is portable-media-ready and feature AM/FM radio, USB input, and aux input x 2 for connecting portable media devices. The receiver has a solid aluminum chassis and IP-66 salt fog rating for durability. Compatibility Bluetooth Peak Output Power 45W x 4 Front Inputs Aux, USB Waterproof IP66. NOTE:The stereo itself is water proof the housing is water resistant (splash proof). We reserve the right to make modifications/improvements to our products at any time. Vehicles may have changes throughout the year. Therefore, pictures are a representation of the product you will be getting but may vary due to product revisions.